Cherries are a tasty summer treat, but at the same time are very healthy. They are a good source of vitamin C and valuable fibre, on the other hand they are poor in fat. This is why they are an excellent choice for those who take care of their body weight. Folk medicine recommends a multitude of products including the leading fresh juice from the cherries, tea from stems of cherries, with which you can lower your cholesterol, relieve physical and mental exhaustion, break stones in the kidneys and bladder, cure impotence and solve the problems with dandruff. We will deal just with those issues in this article, and if you want to learn how to make these products stay with us. Cherry is originally from Asia Minor and in Europe it flourished as a wild tree in prehistoric times. The Romans were the first to see the cherry tree in Kiresun, Greek colony in Asia Minor. According to Pliny, the Roman general Lucullus brought them to the Apennine peninsula 74 years BC and planted them in the garden of his Roman castle, where they first became sensations, and very quickly they became the favourite fruit of the court. What is the Latin name for cherry and how did it got its name? Greek "keratos" which is the basis for the Latin word "CERASELA", which in turn comes from "Keros" the Greek word that is translated as a horn. It is now thought that this name refers to the hardness of cherry wood. Just after the Latin word "CERASELA" are based the names of the same meaning in the Romance, Germanic and Slovenian languages. For the cultivation of cherries Greeks and Romans take all the glory because they spread it along the Old continent with their legions. Even then, it was known that the juice from the cherries very much helped the army to quickly recover after major physical effort, and to the legionaries this was very important, it improved their moods and kept their morale very high. Also, even in the ancient writings seeds and stems of the cherries are mentioned and their remedial properties, which were used to make soothing teas and other medicinal recipes. Cherry tree can reach more than 4 meters in height and it flowers in May. The white flowers have long stalks from which they develop yellow or red fruits. They have a sweet taste and pleasant aroma with characteristic round seed in the middle. It can grow as a wild cherry, which is classified as an extremely healthy fruit of which you can use petiole and fruit. They are both used for healthy tea from cherry stems and fresh juice from the cherries. According to the guidelines of proper nutrition pyramid, they are in a group with other types of fruit. For this group of foods 2-4 servings a day are recommended. The energy value is only 32 calories per 100 grams of fresh foods. In a hundred grams of fresh cherries there is 0.2 g of fat, 1 g of protein, 16 g of carbohydrates, 16 g of sugar, 2.1 g of fibre, while the rest is water. This low-calorie fruit contains all necessary vitamins and minerals valuable to our organism, although there are in a lesser amount. Also, they contain pectin, cellulose and organic acids (malic, tartaric, and citric). It is rich in mineral potassium, which is why they have a beneficial effect on the extraction of water from our body. Cherry juice and fresh fruits are known for having a great effect on purifying the blood and raise energy. Its extraordinary healing properties were known in ancient Rome, and so the Galen gave sweet cherry against constipation to his compatriots. It is now known that this fruit is manifold when it comes to its healing properties. Therefore, its cherry juice, seeds, tea from stalks, as well as resin, which are located in the bark are used. It is interesting that this fruit is in third place among the fruits that lower bad cholesterol known as LDL. It is dangerous because it contributes to the development of atherosclerosis and causes heart attacks and strokes. In the fresh state it is exceptional because it contributes to the elimination of physical and mental exhaustion. It is known that with sour cherries we quickly remove bad mood. They should never be eaten before a meal, because their base reaction will unnecessarily inhibit the secretion of digestive juices, which will be particularly have a bad affected on the digestion of heavy meat meals. Be careful not to drink water after eating cherries and beer and other alcoholic beverages, which is strictly forbidden. The stalk of the fruit is rich in tannins, as well as organic acids, bitter substances, sugars, minerals and flavonoids. Thanks to its composition, in folk medicine the known cure is the tea of ​​cherry stem, which encourages better urination, and consequently helps expulsion of kidney stones and sand. Seeds of wild cherries have long been used to produce oil, which is known to have prevented the occurrence of a heart attack, and its petiole is successfully used as a natural diuretic. They are rich in antioxidants to help fight the called flavonoids. They are found in other dark fruits, and their most important and best-known role is to bind free radicals. That is why fresh cherry juice is recommended because many degenerative diseases such as cataracts, atherosclerosis, and Parkinson’s disease associated with tissue damage are caused by free radicals administration. These fruits are therefore natural anti-inflammatory agents, and work well in relieving the symptoms of asthma and allergies. These beneficial fruits strengthen collagen, which is the basic building block of our connective tissue as well, and is extremely important for healthy tendons and cartilage. Also, antiocians found in cherries block inflammatory enzymes and alleviate pain. Therefore, it is said that 20 fresh cherries are 10 times more effective than aspirin, and they have a positive effect in the treatment of gout and arthritis pain. They are considered an excellent source of boron, which combined with magnesium and calcium works extremely well on the health of our bones. Cherry juice during pregnancy is okay to drink, there will be no side effects, and it is preferable to eat fresh fruits. This fruit ripens in June. No matter which varieties it belong to. It also has a fairly short lifespan, so in the time of purchase select those with stems, and strong red colour and firmer outer skins, if you are planning to make a good homemade cherry juice. In the fridge you can keep it only a few days. To well washed cherries, remove the stem and seeds, then freeze them (individually) on a suitable substrate, and after that pack them in plastic bags. You can buy candied fruit or find homemade compote of cherries, which you will definitely like. If you eat them fresh, or drink cherry juice, always wash them just before serving. If you dip them in the chocolate that you previously melted, you can get an interesting decorations for your favourite treats. Fresh cherries, pitted and without stems are used for the preparation of both salty, and sweet dishes. It is a common ingredient in fruit salads, stuffing for pastries and a variety of cakes. Mashed cherries can be used for storing sorbet, ice cream, sauces and foams, either alone or in combination with other fruits, chocolate or vanilla cream. In some countries, they are used to prepare fruit soups or sauce that is served with roasted duck, pork or turkey. In addition to freezing, they can be preserved by drying and with sugar in the form of jam or compote, and in combination with alcohol. They are in fact famous for preparing a famous cherry brandy. 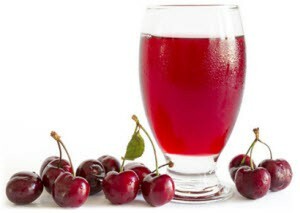 Alcohol free, sterilized cherry juice strengthens the heart muscle and diseases of blood vessels. Preparing the juice is simple, it is made from crushed fruit trees which are only allowed to settle overnight and in the morning squeeze them through a linen cloth. For a full glass of juice you add half a cup of powdered sugar, cinnamon bark and a few cloves. Everything should be mixed well, and then disposed to stand for four days in the sun or other warm place. Then the obtained juice is poured into the appropriate glass bottles, which in the end you need to be sealed good and turned upside down and put in the sand (preferably in a basement room) and so it can be kept for years. It is dosed three times a day with a small glass of half a decilitre, always after a meal, to strengthen your heart muscle and preventive heart diseases. If fresh cherries are very good for removing physical and mental exhaustion, the juice from cherries can be very useful for professional and recreational athletes, because it can reduce muscle pain after running. The study which included 60 healthy subjects, aged 18-50 years. Those who drunk 3 dl of cherry juice daily had significantly less unpleasant muscle pain after running in the long run than those who consumed other types of juices. Although the exact mechanism of action is not yet clear, scientists believe that the juice of cherries works like common a drug that athletes take to ease the inflammatory condition after strenuous physical activity. For a good detox it is best for couple of days to eat only healthy fruit, and freshly squeezed juice from the cherries is recommended. This is an excellent and very effective detoxification and treatment for cleaning the whole body of harmful substances, especially toxins. It is best to apply it before the end of spring, at the turn of the year, regardless of how you feel. Eat it three times a day, always after a meal, a larger amount of fresh cherries and up to 400 grams per serving. First, the stem should be dry, chop them finely and wash thoroughly. Put them in boiling water, let it boil for 2 minutes, then remove to the side, drain well and drink while still warm. This extraordinary tea for kidneys will help far more quickly to dissolve stones and cleanse the urinary tract of sand. It will encourage increased urination and therefore the cleaning of urinary channels. When other means fail, cherries stems are proven to help, freely make natural juice out of cherries and use it without hesitation. With the same problems seeds of wild cherry will also help. You need to ground them as much as you can in the mortar and pour the alcohol of 96 percent. Close in the appropriate bottle, wait ten days, so sit. After that take 5 to 10 drops in a little water. Drops of the pits in this amount are dosed once daily. Here is how to make this drink. Take thirty grams of finely sliced ​​cherry stems and cook for two minutes in one litre of water. Filter well and drink freely while still warm. Dose this tea three times during the day (always after meals) in an amount of about 2.5 decilitres. Cherry tea will dissolve the mucus in the bronchi and make you cough up phlegm easier. Cherry syrup for better functioning of the liver and digestive organs. Take 30 to 50 grams of cherry stems and cover with cold water (1 L) and allow it to stand for 12 hours. Then cook for a few minutes all together and then pour over whole fruit cherries or apples. Now let it rest in the next twenty minutes, then you need to strain it through cheesecloth. Thus obtained juice from cherries, should be drunk 4-5 cups a day. This drink is recommended equally to sick, and healthy people. It will accelerate better urination, and as the final result it will recover the liver, stomach and kidneys. The resin flowing from the wounded bark of cherry wood needs to be dissolved in a high-quality wine vinegar, massage it into the scalp and it will remove dandruff. The same vinegar with cherry resin is used to remove mange from the skin. Healing effects of stems and fruits of cherries are used in the preparation of masks to remove bags under the eyes, and care and revive dry skin. Take 30 to 50 grams of stems of cherries, topped with a litre of cold water and let it stand for 12 hours. Once that period is over, cook them a few minutes. In the end, filter it well and use as a lining for the face. Cherry juice for dry skin care. For dry skin squeezed juice from cherries or just crushed fruit does wonders. Crushed fruits are directly applied to the face, and the juice is well soaked in linen cloth. After twenty minutes of applying this mask, the face is washed with a mild and tepid tea of ​​chamomile or warm water. The cherry pits there is a small amount of amygdalin, which is also called vitamin B17 or Laetrile. It is believed to have positive effects on the reduction of tumour and prevent the spread of cancer, as well as used as a relief of pain caused by carcinogenic processes. Some nations, such Hunza in Pakistan, have always been using amygdalin in the food and they never got cancer, the scientists were led to the conclusion that it is a food that prevents cancer. Laboratory experiments have confirmed it. However, all these studies are very controversial, since it is known that Amygdalin contains cyanide component, which we know is poisonous. In any case, local cherry juice, fresh picked fruits, as well as a mild tea made from the stems are more than good, and feel free to use them in the upcoming summer period.